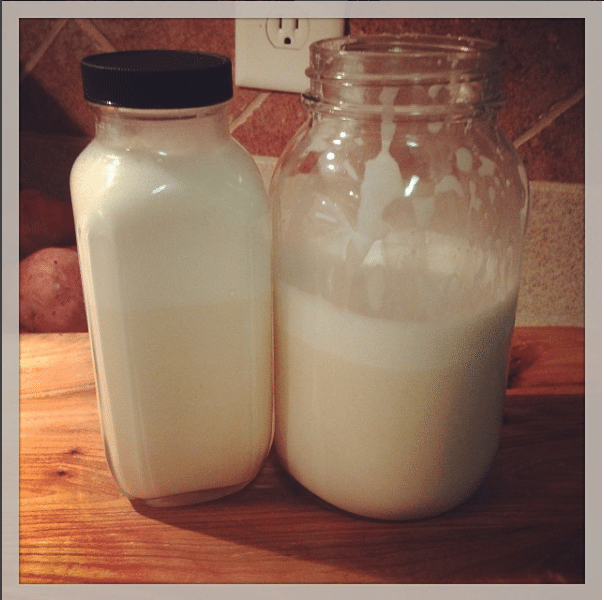 I always recieve so many requests for recipes on homemade almond milk, so here it is folks. This is the recipe that I use whenever I make my own almond milk. Feel free to double the ingredients to double the amont of almond milk you make. This stays in the fridge for about 5 days before you should toss it…. if it lasts that long before you drink it! 2. Drain the almonds and rinse until the water runs clear, usually I need to rinse twice. 3. Add the almonds and two cups water to a blender. If you are using a juicer, pour the almonds and a little bit of water into the juicer slowly so it does not get clogged. 4. BLENDER: Start on a low setting and increase the speed until the almonds are totally pulverized. This could take 2 minutes in a high-powered blender or longer in a regular blender. In a juicer, you will be left with almond milk at the end. There is also just one setting for the juicer. 5. Pour almond milk into the blender if you are using a juicer, then add your sweetener of choice, vanilla extract, sea salt and cinnamon and blend. (optional). If your blender can’t totally break down the almonds, strain the milk through a fine mesh strainer or cheesecloth** before blending in the added sweeteners. 6. Store the milk in a covered container in the refrigerator. It should keep for 3 to 4 days. *The ratio of water to almonds (4 to 1) in this recipe yields almond milk between 2% and whole milk in terms of creaminess. Use less water for even creamier results. **You can keep the leftovers after you have strained it. Strain it again and wring it out. Place pulp on a cookie sheet and bake in the oven at 300°F for about 1-2 hours or until dry. You can eat it as a snack or break it up and add it to salads, etc. for some extra protein and crunch!